Brad Schwartz, CEO of Monarch Bank in the Hampton Roads area will talk on "Building More than a Great Company" as Executive-in-Residence at the Longwood University College of Business and Economics. Schwartz's day with students will be capped off with a public presentation on Thursday, Feb. 20, at 7 p.m. in Longwood University's Wygal Hall Auditorium. Brad Schwartz, CEO of Monarch Bank in the Hampton Roads area, will speak Thursday, Feb. 20, at 7 p.m. in Longwood University’s Wygal Auditorium. Schwartz will talk on “Building More than a Great Company” as part of the Executive-in-Residence lecture series in the College of Business and Economics. He is a 1984 Longwood graduate and member of the university’s Board of Visitors. 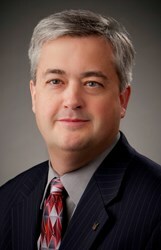 Schwartz joined Monarch Bank as chief financial and operating officer in 2004 and was elected CEO in 2009. Founded in 1998 and headquartered in Chesapeake, Monarch Bank has assets of more than $1 billion and 13 offices in Chesapeake, Norfolk, Suffolk, Virginia Beach, Newport News and Williamsburg. The bank was recently named one of the 2014 Best Places to Work in Virginia by Virginia Business magazine. Schwartz, who lives in Virginia Beach, also has held senior positions with three other Virginia-based community banks and began his career as an examiner with the Virginia Bureau of Financial Institutions. He is a member of the board of directors of the Federal Reserve Bank of Richmond. A certified public accountant, he has an MBA from the University of Richmond. The Executive-in-Residence program is a public service of the College of Business and Economics and is made possible through the generous corporate support of Barrett Capital Management LLC and Eagle Fire Inc.
Longwood, a public university of nearly 5,000 students, was featured in The Princeton Review's book, "The Best Value Colleges: 2013 Edition.” For more information, go to longwood.edu. Longwood’s College of Business and Economics, accredited by AACSB International, prepares effective and successful business leaders by guiding students to develop their full potential. A dedication to leadership values and ethics builds upon Longwood University’s mission to develop citizen leaders. The college’s required and outstanding internship program ensures that all students practice their business skills and apply their knowledge in the real business world. The College of Business and Economics offers Bachelor of Science in Business Administration, Bachelor of Science in Economics, and MBA degrees. In fall 2014, it will offer an MBA in Real Estate.